Postman Pat vehicles have come a long way since the first mini die-cast vehicles by Ertl in the 1980s. Pat’s red van, Pat 1 is the original iconic vehicle from the show. The old classic Royal Mail red Postman Pat vehicle was based on the Vauxhall Bedford HA van. Past toys of Pat 1 were made by ERTL and Corgi (die-cast) and ER (pull back and go). Subsequent episodes of the ‘classic’ Postman Pat featured Pat driving the then ‘Pat 2’, a red Royal Mail Postbus which doubled as the Greendale bus as well as carrying larger parcels. Later on Pat was seen driving a yellow school bus for Julian and the other children. Nowadays, thanks to the Special Delivery Service, Pat has quite a fleet of vehicles to choose from. 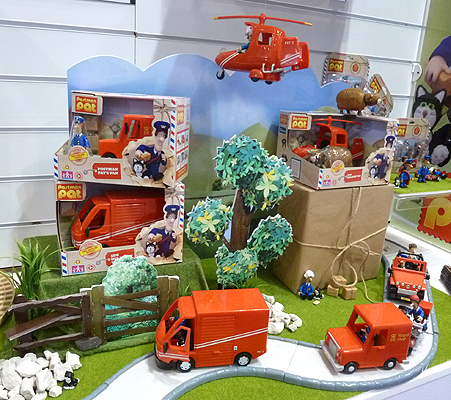 There are now, thanks to UK toy maker Character Options, several toy Postman Pat vehicles to choose from. Similar to the earlier Born to Play range, each vehicle plays the Postman Pat theme tune and also emits phrases from the appropriate character. Apart from Pat’s vehicles there are also the Greendale Rocket, PC Selby’s Police Car and Ted Glenn’s Truck. Pat himself has his iconic Postman Pat van, but now also a brand new SDS Delivery Van. 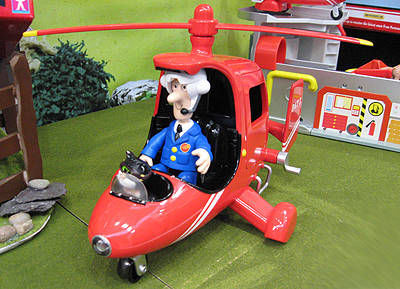 Also available are toy Postman Pat’s SDS Motorbike and Postman Pat’s SDS Helicopter. 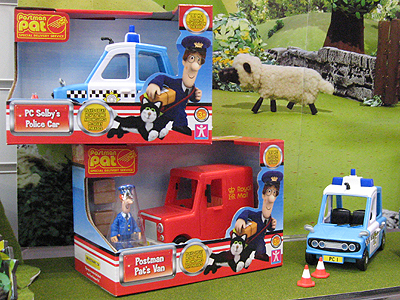 All the Postman Pat vehicle toys come with either accessories or figures or both. 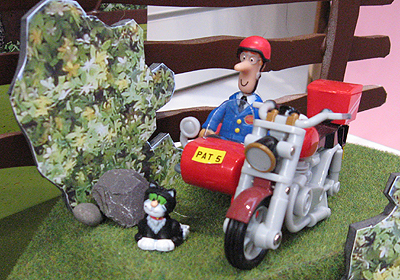 The Postman Pat vehicles are scaled to the figures and playsets.